Irina has more than 15 years experience in dispute resolution, including commercial litigation, cross-border litigation, international arbitration, and mediation. Ms. Nazarova has acted as Of Counsel to the Head of the State Property Fund of Ukraine. She is regularly engaged as counsel, arbitrator and expert in arbitral proceedings under various arbitral rules. Irina moves easily between traditional litigation, international arbitration, and ADR, matching her professional courtroom and arbitration skills. Irina Nazarova is a Member of the ICC International Court of Arbitration. 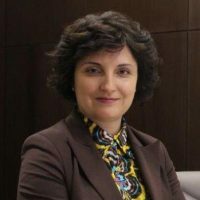 She is ranked as a leading lawyer in dispute resolution in Ukraine by Chambers Global (Band 1), Chambers Europe (Band 1), Who’s Who Legal (Litigation, Arbitration, and Product Liability Lawyers), The Legal 500, PLC Which Lawyer?, Best Lawyers International.